MEASUREMENT OF PHOTOTOXICITY OF SULPHONATED CHLOROALUMINIUM PHTHALOCYANINE ON MODELS SYSTEMS. We have been studying some properties of the new generation of photosensitizers. We have chosen especially phthalocyanine ClAlPcS2 and ClAlPcS3. A semiconductor laser with output power of 21 mW and 675 nm was selected, because its wavelength corresponds to absorption maximum of phthalocyanines in the long-wave region of the visible part of electromagnetic spectra. To find optimum therapeutic doses for i. v. or local application, it was necessary to test the maximum non-toxic concentration of phthalocyanines and minimum phototoxic level related to laser irradiation in different model systems. Standard testing system for definition of the in vitro cytotoxicity and phototoxicity based on MCF7 (human breast adenocarcinoma), was developed. The optimum combination of phototoxic concentration and laser irradiation of wavelength 675 nm at a dose of 25 J/cm2 was 1.8 m g/ml ClAlPcS2 and 0.7 m g/ml ClAlPcS3 respectively. Efficiency of PDT was affected by the following factors: absorption spectrum of the photosensitizer, wavelength of the activation light, depth of the light penetration in the tissue, and see tissue response to singlet oxygen. Photodynamic therapy (PDT) is a treatment that is used for destruction of certain tumours. The treatment is performed with dyes that generate reactive oxygen species in the presence of light and oxygen. Reactive oxygen species cause both cell death and damage to blood vessels thus contributing to tumour regression. Dyes such as hematoporfyrin derivates for this type of therapy are used (1). Disadvantage of the hematoporfyrin dyes is that they exist as a mixture of various, mostly unidentified compounds. Moreover, they absorb light at relatively short wavelengths that do not penetrate deeply into tissue. To circumvent these disadvantages other dyes are tested in PDT such as chlorins, phthalocyanines, etc. Phthalocyanines are chemically pure compounds that absorb light of longer wavelengths than hematoporphyrin derivates with absorption maximum at about 680 nm (2, 3, 4, 5, 6). Phthalocyanines, belonging to a new generation of substances for PDT are chelated with a variety of metals, chiefly aluminium and zinc, while these diamagnetic metals enhance their phototoxicity (7). A ring substitution of the phthalocyanines with sulphonated groups will render them water soluble and affect the cellular uptake. Less sulphonated compounds, which are more lipophilic, show the best membrane - penetrating properties and highest biological activity (8). The kinetics are much more rapid than those of HPD, with high tumour to tissue ratios (8:1) reached after 1-3 hours. The phthalocyanines are eliminated much more rapidly, almost without fluorescence seen in the tumour after 24 hours (9). In this paper we report on the optimal combination of maximum non-toxic concentration of phthalocyanines and minimum phototoxic level related to laser irradiation for MCF7 cells. The flourometric measurement with Fluoroscan Ascent was used for definition of in vitro cytotoxicity and phototoxicity. Morphological changes of the MCF7 cells were observed in an inversion fluorescent microscope Olympus IX 70. Source of light: Semiconductor laser Med 140 (Lasotronic, Ltd. l = 675 nm, 21 mW) was used as a source for invocation of the photodynamic effect. Cells: MCF7 (Human breast adenocarcinoma) cells (obtained from Masaryk Memorial Cancer Institute, Brno-Czech Republic) were used as a standard testing system. Phototoxicity of phthalocyanines for MCF7 cells. Twice washed tripsinized MCF7 cells were divided in amount 104 to each well and filled in MEM with 10% FCS in a total volume of 0.1 mg/ml. After 24 hours of cultivation at 37 oC in 5% CO2 the photosensitiser was added. The final concentration of phthalocyanine ranged from 0.1 m g/ml to 1540 m g/ml in a total volume 0.15 ml. MCF7 cells in mixture with photosensitizers were cultivated for 24 hours. Cytotoxicity of ClAlPcS2 and ClAlPcS3 without irradiation for MCF7 was tested. The values of IC50 were obtained. Only the cells in the range from 0.1m g/ml to 10 m g/ml were subsequently irradiated by a laser of wavelength 675 nm at a dose from 10 J/cm2 to 100 J/cm2. The controls contained cells in a cultivation medium only. Morphological changes of the MCF7 cells during cultivation have been observed in an Olympus IX 70 inversion fluorescent microscope. The vitality of cells was evaluated 24 hours after irradiation. For identification of live and dead cells, the fluorescent probes ethidium homodimer and calcein were used. The previous results were also proved by flourometric measurement with Fluoroscan Ascent. MCF7 cells were irradiated by a laser before incubation without addition of photosensitizers. Laser irradiation of wavelength 675 nm at doses in the range from 10 J/cm2 to 500 J/cm2was used. The vitality test proved that the vitality was not significantly influenced in the ranges of doses tested. Control measurements were in the range of 90% - 100%. 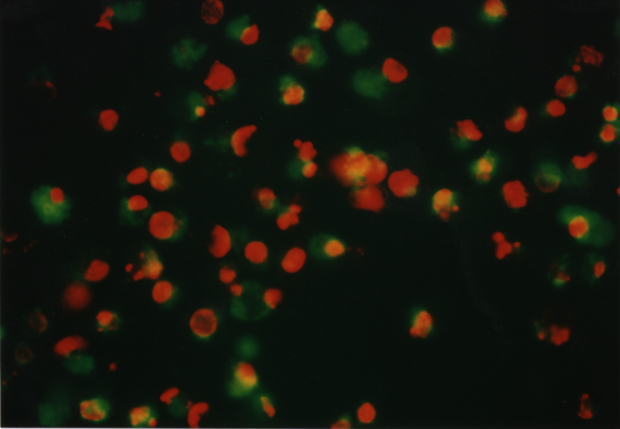 Cytotoxicity of the phthalocyanines for MCF7 cells. The values of IC 50 for ClAlPcS2 and ClAlPcS3 were 799 m g/ml and 662 m g/ml respectively. Phototoxicity of the phthalocyanines for MCF7 cells. The optimum combination of phototoxic concentration and laser irradiation of wavelength 675 nm was 1.8 m g/ml ClAlPcS2 and 0.7 m g/ml ClAlPcS3 at a dose of 25 J/cm2. The statistical evaluation of results was based on analysis of variance at twice sorting. The influence of the levels of irradiation doses was proved be statistically significant (p < 0.05). Analysis of Variance was completed by the Duncan test. The optimum phototoxic effect of MCF7 was observed at 1.8 m g/ml ClAlPcS2 in combination with laser irradiation 25 J/cm2. Fluorescence microscopy showed (see Fig. 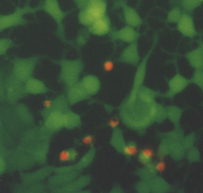 6) living (green fluorescence) and dead (red fluorescence) cells. Fig. 5 shows a control culture of MCF7 cells. Fig. 5 MCF7 control cells. 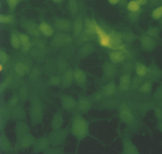 The cells were treated by fluorescent probes (calcein AM and ethidium homodimer) and than observed in an Olympus IX 70 fluorescent microscope, magnification 300. Photodynamic therapy requires three simultaneously present components for cytotoxicity: a photosensitizer, light, and oxygen. The wavelength of light that activates the sensitiser used dictates the proper light spectrum, as well as the treatment effect. There are four properties that would make a photosensitizer ideal for PDT. The practical advantage of the in vitro tests is a rapid availability of data on the nature of the effect of the tested substance, defined conditions of testing in the tissue culture, accuracy and objectivity of the test results. This testing mode provides important complementary information about biological properties of the substances examined in vivo. In our study MCF7 cells were used as the cellular system for in vitro testing. The reasons for using these cells have been their prompt availability, high sensitivity and a wide range of pathophysiological changes. These pathological changes can be easily detected and influenced by endogenous factors. The vitality test in MCF7 is well suited to establish cell membrane integrity. The vitality for irradiation doses in the range 10 J/cm2 to 100 J/cm2 proved that the vitality was not significantly influenced in the tested ranges of doses without photosensitizers (Fig.2). The influence of certain phthalocyanine concentrations at a combination with laser irradiation doses has also been studied by the in vitro methods. The concentration of the photosensitizers at a volume of the tissue has to be related to the irradiation dose. It is generally supposed that there is a necessity for less light energy at a high photosensitiser concentrations. The increase of the irradiation dose was proved to be more important than the photosensitizer concentration in our experiments. A significant influence of the levels of irradiation doses on both vitality was proved (p < 0.05). Analysis of Variance was done using the Duncan test. The results obtained by the in vitro methods must be supplemented and defined more accurately on model systems under in vivo conditions. Our next experiments will be directed towards evalution of the mechanism of the cell death. Our data show that ClAlPcS3 is a more promising photosensitizer for in vitro PDT of cancer than ClAlPcS2. In comparison the ClAlPcS3 is more phototoxic at both lower doses of irradiation and lower concentrations. From IC50 results we can expect less in vivo toxicity. W.E. Rizzoni, K. Matthews and H.I. Pass, In vitro photodynamic therapy of human lung cancer. Influence of dose rate, hematoporphyrin concentration and incubation, and cellular targets, Surg. Forum, 38 (1987) 452-455. R.R. Perry, W. Mathews and J.B. Mitchell, Sensitivity of different lung cancer histologies to photodynamic therapy, J.Cancer. Res., 50 (1990) 4272-4276. E.K. Matthews and Z.J. Cui, Photodynamic action of sulfonated aluminum phthalocyanine (SALPC) on AR4-2J cells, a carcinoma cell line of rat exocrine pancreas, Br. J. Cancer, 61 (1990) 695-701. T.W. Sery, J.A. Shields and J. Augsburger: J. Photodynamic therapy of human ocular cancer, Ophthalmic Surg., 18 (1987) 413-418. C. Ometo, C. Fabris, C. Milanesi, G. Jori, M.J. Cook and D.A. 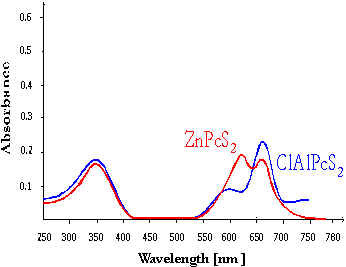 Russel, Tumour - localising and photosensitizing properties of a novel zinc (II) octadecylphthalocyanine, Br.J. Cancer., 74 (1996)1891- 1899. H. Lui and R.R.Anderson, Photodynamic therapy in dermatology: Recent developments Dermatol. Clin., 11 (1993),1  13. I. Rosenthal and E. Ben-Hur, Phthalocyanines. Principles and Applications (Lever, A.B.P., Leznoff, C.C. eds). New York, VCH Publishers. (1989), 395-425. D. Wohrle, N. Iskander and G. Graschew, Synthesis of positively charged phthalocyanines and their activity in the photodynamic therapy of cancer cells, Photochem. Photobiol., 51 (1990) 351-356. C.J. Tralau, H. Barr and R. Sanderman, Aluminum sulfonated phthalocyanine distribution in rodent tumors of the colon, brain and pancreas, Photochem. Photobiol., 46 (1987) 777-781.